Hello! 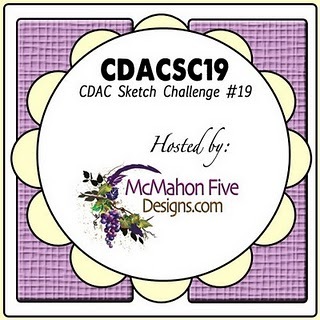 McMahon Five Designs is hosting the sketch challenge this week at the Crafter's Digital Art Center. Sue is giving away this beautiful butterfly for everyone to use, and she created the fabulous sketch too! Here is my card that I made with Sue's sketch and butterfly. My sentiment is from Impression Obsession and the paper is from Prima 'Madeline'. Here is a close up for you. I put a pearl on the head of each butterfly, and glued only their bodies down so their wings are free. And here is the sketch. You have until March 23rd to play along. You get the butterfly for free just for playing along, and you also have a chance at winning 2 free digis of your choice too! What a beautiful card, Amy! I love the color combination and the softness of the bow. To receive this card during such a difficult time would surely put a smile on the face of the recipient. This is such a beautiful card, your butterflies are colored to perfectly! Love the sentiment too. such a beautiful card...those butterflies are precious! GORGEOUS creation Amy! I love this butterfly offered by McMahon Five and enjoyed creating with it! Wow-Gorgeous card. 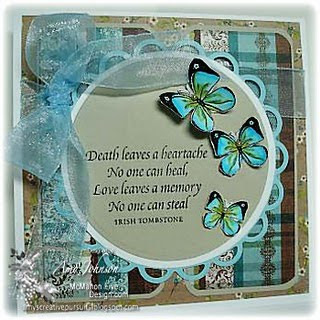 The butterflies are so pretty- I love the sentiment and the ribbon is gorgeous!